This Rumble ended on 2005-04-01 00:00:00.0. Backstory: Kaz undertook a Minotaur "life debt" to Huma Dragonbane due to Huma saving his life . Backstory: Chewbacca undertook a Wookiee "life debt" to Han Solo due to Solo saving his life. Chewie was in trouble. He was pinned down. Shots from laser pistols whizzed by him and exploded near him. Han Solo and his half-cocked schemes had landed him in a fine mess again. Not that the wookie would ever complain, too much anyway. Jabba the Hut had sent the smugglers to appropriate a rare piece of technology that was said could open wormholes through space. Chewbacca only had the briefest look at it before he had to pocket it and run. Han Solo had run off to the far side of the base hoping to create a distraction. Unfortunately it wasn’t enough and now the wookie was stuck at the far end of a hallway with no way out. Stormtroopers closed in on his position and he was going to be captured, if he wasn’t killed first. Then the wookie had an idea, he pulled out the transporter and enabled it. A ray of light shot out and created a watery image of green hills and rainy skies. Chewie assumed it was the planet below the spinning space station he was on. So Chewbacca took a chance and leapt through the portal. Kaz was headed west. He had just witnessed the Knights of Solamnia lay Huma Dragonbane to rest a few days prior and he was in a foul mood. It was raining and the minotaur was camped out by himself. He had to figure out what to do with his life. He knew that heading back to his homeland would likely get him killed. He also knew that staying where he was would not be much better. So for now he sat, miserable and in contemplation. A flash of light to his left startled the minotar and he grabbed his axe. As he rolled to his feet a massive body leapt straight from thin air. His first impression was that it was another minotaur, perhaps one of his own family seeking to kill him and bring honor back to his family. But he quickly realized his mistake. This was not a minotaur. The hair was too long and it was too skinny. It stood a foot taller than the minotaur and held a number of strange metallic objects that Kaz could only assume were weapons. Kaz lunged forward and Chewbacca fired a warning shot off with his laser rifle. 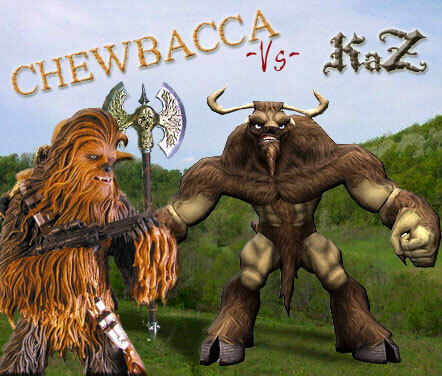 The minotaur swung his axe and knocked the rifle from Chewbacca’s grip. The wookie kicked upward with his long strong legs and sent Kaz’s axe flying in the opposite direction. The two combatants faced off with nothing but their bare hands and incredible strength.